For Web Design and SEO needs, WebpagesThatSell will help you. Contact us now! Dawn Stebbing, Executive Presence Coach and speaker, wanted to update her online presence. As her business and personal presence had evolved, it was important that her website reflect who she was presently. The Web Pages That Sell team was able to create the brand image she imagined and added several strong business-building components that were lacking in her previous website. Today, Dawn feels that her brand message online is congruent with her personal presence and messaging when working with clients in person. Because Dawn’s image consulting business had evolved, she was seeking an updated look for her website that was fresh, beautiful and inviting. Staying true to what she teaches as an Executive Presence Coach, it was critical to align her online branding to reflect how she presents herself and her services today. When Dawn envisioned the look and feel of her website, she grew frustrated that the colors, banner and special font she most desired were seemingly unavailable. Because she knew me for years and loved the work that Web Pages That Sell did for others, she reached out to us requesting a website that would include the “presence” that was missing on her outdated website. She required a polished and professional style that would also include an easy-to-use eCommerce section. 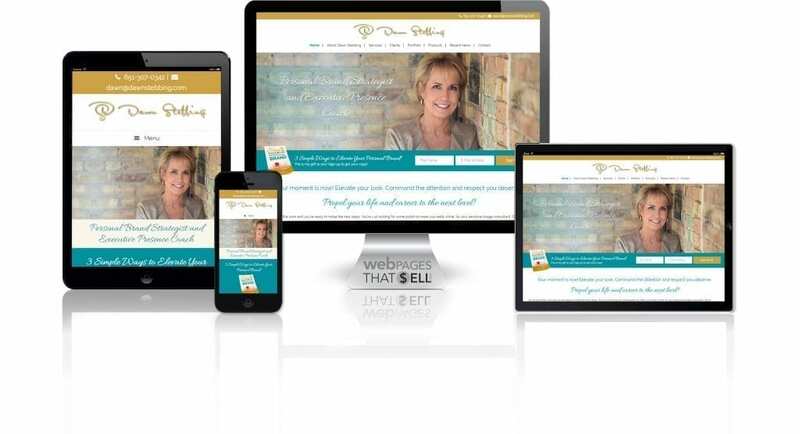 Dawn approached us to create a fresh website to be consistent with the poised, polished and inviting image that both she and her business embody. Professional presence, which she speaks about, is ever-changing over the course of careers and life transitions. Dawn regularly updated her website content to stay current but this had become increasingly problematic for her due to its complexity. When brainstorming on her project, the importance of incorporating a lead magnet that would reflect her work in a “visual” form made the most sense. We designed a creative way to highlight Dawn’s work by utilizing before and after pictures of her clients while maintaining the appearance of a clean and brand consistent home page. Being able to support Dawn’s original concerns about style and professionalism as well as integrate the eCommerce component into her website were a strong base. Once we added the client attraction and easy-to-update content components, her website became the full-service marketing tool she sought that reflected her brand, best served her clients, and was made content update painless. As experts in web design and functionality, we first addressed Dawn’s frustrations around the inability to get the fonts, banners or colors she wanted. We were able to implement all her preferences. Her marketing needs went beyond the “look and feel” of the site, though. Dawn said she would panic whenever she had to make content changes, so the Web Pages That Sell team created the capability for her to update the content with ease. After strategizing about the professional look of the site, we implemented a lead magnet component and eCommerce capabilities. During the project brainstorming phase, the importance of incorporating a lead magnet that would reflect Dawn’s work in a “visual” form made the most sense. Because the visual essence of first impressions is central to her brand, we proposed using before and after pictures of her clients in lieu of another form of capture page, such as a newsletter sign up. By designing this a creative way to highlight Dawn’s work, we were also able to maintain a home page that was clean and brand consistent. We incorporated beautiful pictures on the home page as a captivating way for website visitors to immediately visualize a small collection of her success stories. Simultaneously, testimonials actively rotated to grab further attention to the benefits of working with Dawn. The website copywriting is now consistent and reflective of her style. The eCommerce component is user friendly. Being able to support Dawn’s original concerns about style and professionalism as well as integrate the eCommerce component into her website were a strong base. Once we added the client attraction and easy-to-update content components, Dawn’s website became the full-service marketing tool she sought that reflected her brand, best served her clients, and was made content update painless. Dawn works with individuals and groups on everything from mindset and body language to how to utilize color, texture, and style to individually tailor each person’s professional presence. We did the same with her website – making it beautiful and user-friendly externally, as well as being grounded with a strong internal theme, coding, and a solid eCommerce platform. Implementing an attractive, user-friendly method to engage and capture prospects through use of before and after client pictures as a lead magnet was a key business component she was missing with her previous website. Dawn now feels the copywriting speaks to her audience and she can continue to update her messaging with ease. She stated that the site is easier to maneuver and change without having to panic that she’s “messed anything up”. We were able to provide everything she expected from us in professional website design: aligning with her branding presence, creative lead capture, user-friendly eCommerce capabilities and ability to update with fresh content easily and affordably. Web Pages That Sell prides itself on offering a full-spectrum process that builds from addressing initial client needs to design, implementation and training. We listened to Dawn’s frustrations and needs when she came to us. We were able to not only implement what she initially knew she wanted in her website, but also advised and created the additional components that she needed in order for it to be a fully functioning business marketing tool. Rebecca is top notch when it comes to her clients. She is respectful, honest and reliable. The finished product was everything I asked for – I was amazed. I highly recommend checking out Web Pages That Sell before you make a decision. Rebecca is easy to work with, pleasant, a good listener and good at what she does. Is your website set up to make money? 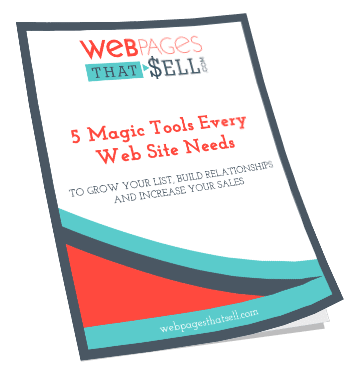 Get your FREE guide, 5 Magic Tools Every Website Needs to Grow Your List, Build Relationships and Increase Sales! © Copyright 2019 · Website Marketing Solutions - SEO & Web Development | WebpagesThatSell · All rights reserved.